I was looking to make some easy steaks but somehow I made some of our favorite steaks of the year! They were a great way to round out the end of summer grilling. If you have some grilling and a touch of summer left in you then throw a couple of steaks on the BBQ and enjoy! Mix together the cheese and chives in a small bowl. Rub steaks evenly with olive oil, then crack fresh pepper and sprinkle kosher salt lightly over both sides of steaks. Brush steaks and onion fans with olive oil and place steaks on lower grill rack for 3-5 minutes. Flip steaks and cook for an additional 3-5 minutes or until desired doneness. 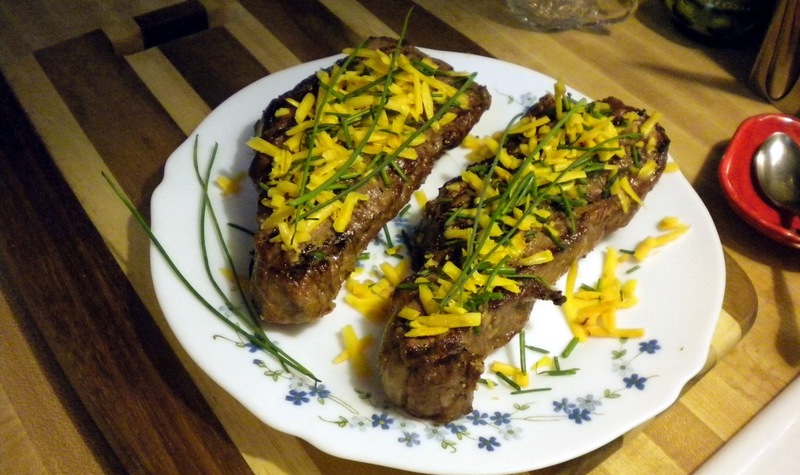 Remove steaks from grill, Top with half of the chive and cheese mixtureand let sit for 5 minutes. Serve while still hot, enjoy!